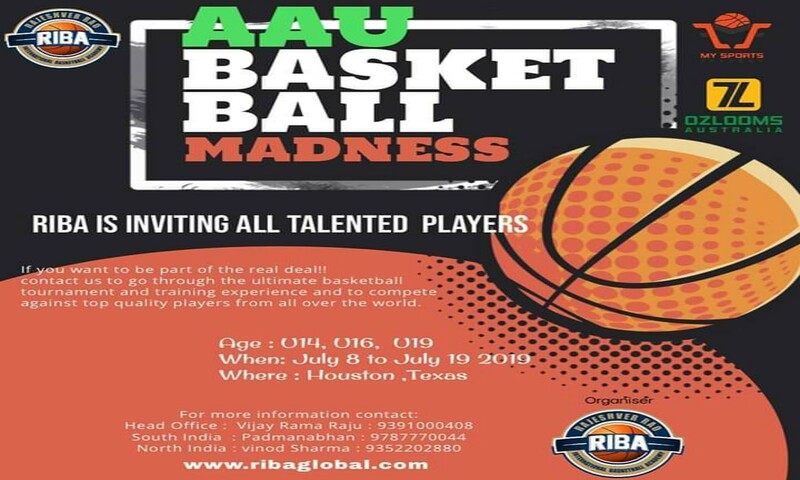 Hyderabad, 20th March 2019: The Rajeshver Rao International Basketball Academy (RIBA) is inviting talented Indian basketball players to compete in the Amateur Athletic Union (AAU) circuit in the US. RIBA, in association with My Sports Factory and apparel partner Ozlooms Australia, is inviting Indian players in the U14, U16 and U19 age groups, to head to Houston, Texas to play in AAU tournaments between 8th to 19th July. Interested participants have been requested to send expressions of interest so that the tour can be planned accordingly. Over the last few decades, AAU has become the main breeding ground for high school talent to get noticed prior to the college/pro level. Although heavily criticized by leading coaches and players for focusing more on “winning” rather than player development, there is no doubt that AAU gives the opportunity for talented players on otherwise mediocre high school teams to form “super teams” with players from other schools and compete against the best competition across the USA. The AAU operates in more than 34 sports, under which it conducts over 30,000 age division events and 250 national championships across its 56 district associations.